So this year, my March writing is not just another month of blogging, simply posting a daily piece on the Two Writing Teacher blog. It was a bit more calculated. Year after Year since the number of participants exploded I felt more and more intimidated… puzzled as to how I could share and comment with so many in the community… Year after Year I had no plan..I just tried commenting on as many blogs as I could, and then enjoying comments I received back… but this year other’s from the early years also felt a change. and like me, this year many didn’t slice every day. I didn’t push myself to blog every day. I keep an annotated food journal where I track what I eat and much more about the bigger picture of the day, so public writing is just not as essential. After not slicing/writing/blogging for almost three years, it is great to see that I still have a few familiar blogs to read and comment. There is something special about regular blogging that I missed. I think it is time for me to post regularly as well. Early morning writing has a special place in my heart too. If I could, I would read and write and watch the sunrise every morning! We are very connected Jaana… I think I might be returning to more public blogging… starting on Tuesdays, you? Yes, that is my plan. I need accountability. Seeing the number of people blogging during this challenge can be overwhelming – really great, but overwhelming. Glad to read your posts whenever you show up, Bonnie. What you wrote is a lot of how I felt this year too. I have not been a faithful Tuesday slicer. I do miss it and the community that surrounds my words. Perhaps I will write more often on Tuesdays, but I think I may step away from the challenge of March, that fire to write has burned out. When I found that many who started slicing with me wouldn’t join this year, I thought of dropping out too. But nine is a nice number, and it would be cool to make it to ten, so I write. Like you, my commenting plan is to try to reach the people I know first, and always comment on the three who have posted before me, and if time permits I pick few additional slices. I am glad you are here. I appreciate your comments on my blog. So far I’ve written every day in March, but I’ve missed quite a few Tuesdays this past year. 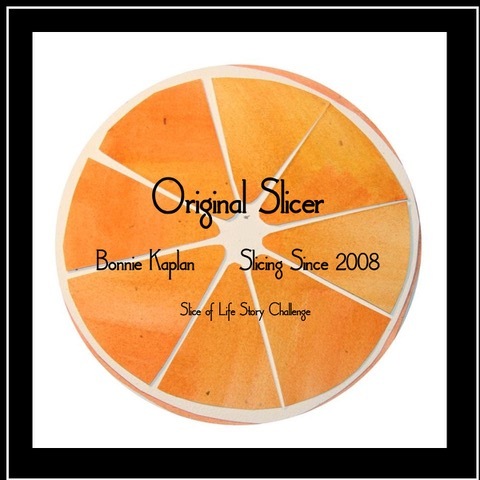 I try to read new slicers, but I always end up spending more time with those I’ve “known” for years. Reading and sharing comments with them is the best. I hope new slicers get connected with each other like that, too. So great to read your “Early morning writing by the light of the screen.” Happy to read your words and hoping to see you on Tuesdays. I’ve given myself permission to slice less on Tuesdays this past year, and with a new grand baby coming soon, I’ll just have to see. Like you, I gravitate to familiar voices.